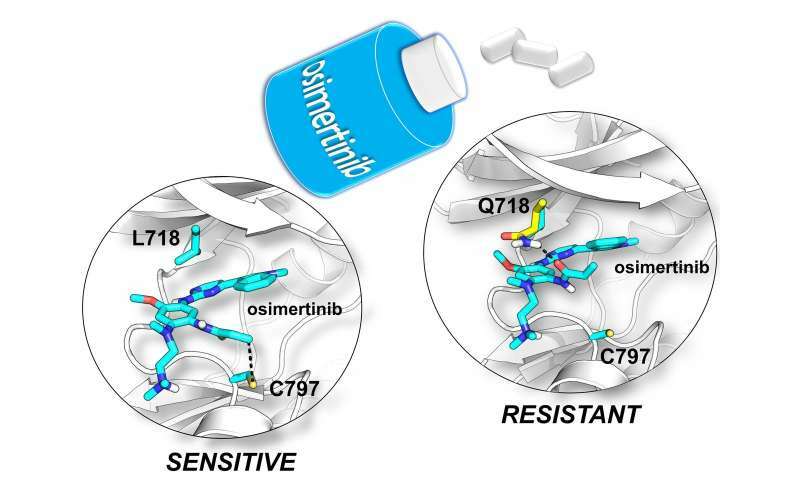 Scientists from the Universities of Bristol and Parma, Italy, have used molecular simulations to understand resistance to osimertinib - an anticancer drug used to treat types of lung cancer. Osimertinib binds tightly to a protein, epidermal growth factor receptor (EGFR), which is overexpressed in many tumours. EGFR is involved in a pathway that signals for cell proliferation, and so is a target for drugs. Blocking the action of EGFR (inhibiting it) can switch it off, and so is a good way to treat the disease. Osimertinib is an effective anticancer drug that works in this way. It is used to treat non-small-cell lung cancer (NSCLC), in cases where the cancer cells have a particular (T790M) mutant form of EGFR. It is a so-called 'third-generation' EGFR inhibitor, which was approved as a cancer treatment in 2017. Osimertinib is a covalent inhibitor: as such, it binds irreversibly to EGFR by forming a chemical bond with it. Although patients generally respond well to osimertinib, most acquire drug resistance within one year of treatment, so the drug stops working. Drug resistance arises because the EGFR protein mutates, so that the drug binds less tightly. One such mutation, called L718Q, was recently discovered in patients in the clinic by the Medical Oncology Unit of the University Hospital of Parma. In this drug resistant mutant, a single amino acid is changed. Unlike other drug resistant mutants, it was not at all clear how this change stops the drug from binding effectively, information potentially crucial in developing new drugs to overcome resistance. Now, a collaboration between medicinal and computational chemists and clinical oncologists has revealed exactly how subtle changes in the protein target cause drug resistance. Using a range of advanced molecular simulation techniques, scientists from the Universities of Bristol and Parma, Italy, showed that the structure of the mutant protein changes in a way that stops the drug reacting and binding to it. Adrian Mulholland, Professor of Chemistry at the University of Bristol, said: "This work shows how molecular simulations can reveal mechanisms of drug resistance, which can be subtle and non-obvious. "In particular, here we've used combined quantum mechanics/molecular mechanics (QM/MM) methods, which allow us to study chemical reactions in proteins. "This is crucial in investigating covalent inhibitors, which react with their biological targets, and are the focus of growing interest in the pharmaceutical industry." His collaborators, Professor Alessio Lodola and Professor Marco Mor of the Drug Design and Discovery group at the University of Parma, added: "It was an exciting experience to work closely with clinical colleagues who identified the mutant, and to help analyse its effects. "Now the challenge is to exploit this discovery in the development of novel drugs targeting EGFR mutants for cancer treatment in future."